Missing teeth can have a negative impact on your oral health, appearance, and self-esteem. Fortunately, implant-supported dentures are perhaps the best possible solution for patients who have suffered tooth loss. The prosthetic teeth are secured by titanium dental implants, which are surgically embedded in the jaw bone to replace the missing tooth roots. The implants integrate with the bone tissue to create the highest level of support and stability. Davey Crockett Dentistry has been helping Richmond, VA, patients restore their smiles for many years, and our team can help you find the right treatment for your needs. Dr. Bousaba uses advanced technology that can help determine your candidacy for implant-supported dentures during a thorough consultation. The first step in the treatment is to place the dental implants into the jaw bone. Dr. Bousaba will make a small incision in the gums to gain access to the underlying tissue, and then insert the implant. Once the implant is placed, Dr. Bousaba will use sutures to close the incision for healing. Because the implants are placed directly in the jaw, they offer unrivaled stability and support when compared to traditional dentures. At your next appointment, Dr. Bousaba will expose the tops of the implants in order to place an abutment. This will help the implants heal properly and prepare them to support the denture. Impressions will also be taken at this time so the dental lab can create a denture to the exact specifications of your mouth. Once your denture is complete and your implants have healed, you will return to have your final denture placed and secured. Dr. Bousaba will any necessary adjustments to ensure a comfortable fit. He will show you how to properly maintain and care for your denture to ensure that it lasts for many years. Dental implants have dramatically changed the efficiency of dentures. 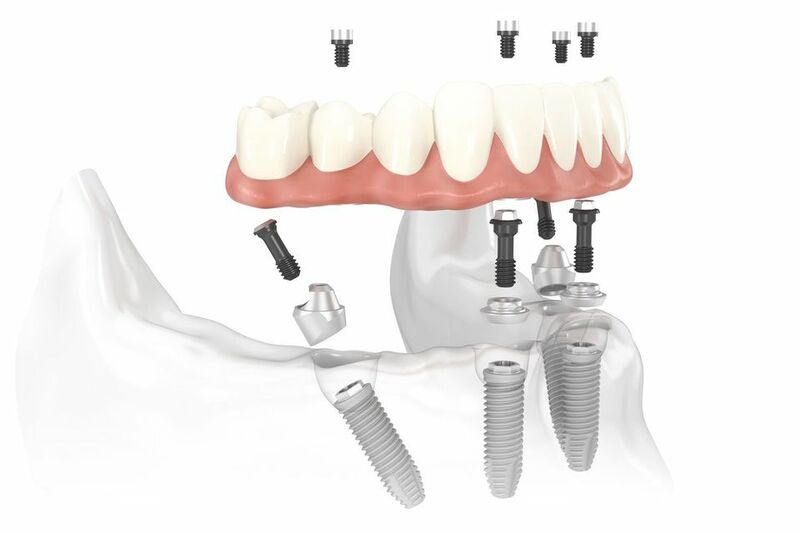 Because the implants are placed directly in the jaw, they offer unrivaled stability and support when compared to traditional dentures. Over the course of about six to eight months, the implant will form a stable bond with the jaw bone. This process, known as osseointegration, is what makes the implants such a secure and superior foundation for your denture. You will be able to eat your favorite foods without worrying about your denture slipping or moving, and can speak with renewed clarity and confidence. Overall, implant-supported dentures can dramatically improve your quality of life. Dr. Bousaba can provide your entire dental implant treatment under one roof, adding convenience and organization to your journey towards a new smile. Our technology, patient care, and experience allow us to provide the highest level of care that is sure to make you smile. Contact our office online or call us at (804) 282-2990 to schedule an appointment. Please use this form to contact a member of our team. Our friendly staff will respond shortly.